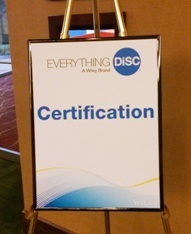 Since I regularly write about Everything DiSC products, I thought it was high time I went to a certification class. For two days I was immersed with all things DiSC. 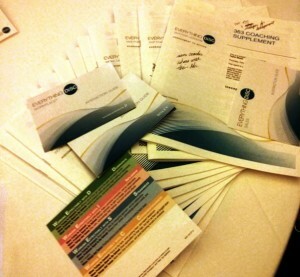 Other participants ranged from new to seasoned trainers and from people familiar with all the Everything DiSC products to at least one who had just taken her first DiSC assessment. Attendees who were new to DiSC asked questions that commonly come up during trainings and we all got to hear how our trainers answered them. From what I heard, everyone found something useful to take home from the classes and so did I. The two days were packed with activities, new information, video clips from the various facilitation kits, and lots of sample profiles. But to my relief we also had frequent breaks and really good food. (I hate to admit that I will judge every training I go to, at least partially, on their food.) If you’re planning attending one of these trainings, be sure to bring a tote bag to the second day so you can easily haul away all the sample reports and interaction guides you receive. I don’t think most attendees had seen each of the Everything DiSC products, from Workplace to the new Work of Leaders, so many left with new ideas of how to incorporate DiSC into their training curriculum. I think it can be a little hard to understand how much the Everything DiSC 363 for Leaders differs from other 360 tools, but the trainers–and the attendees who regularly use it–did a good job. Our trainers were also able to hold our attention while presenting information about the history, theory, reliability and validity of DiSC. Discussions with others about their experiences were highlights for me. I got to hear reasons why some trainers provide everyone in their groups with their profile reports soon after they finish with them and others wait until their training session to hand them out. Some facilitators working with teams with a high level of trust will share their Everything DiSC Facilitation Report with their group. During lunch one table had a discussion about how DiSC was used in their organizations as part of their hiring or on-boarding process. One person who was going to use Everything DiSC 363 for the first time expressed some concerns about it and attendees jumped in with comments like “If you borrow from the video [on the website dedicated to the product] you’ll be great as a facilitator.” Others gave encouragement to use backup notes, to do the same “build the room” or “walk the model” technique our trainers took us through. Other simple tricks shared were table toys like pipe cleaners on the tables to stimulate creativity and help energize participants. Getting back to the important issue of food and amenities, attendees found some great restaurants within walking distance of the hotel, or they took a short taxi ride to new establishments near the Guthrie Theater, or a few ventured out on the light rail to Mall of America. I left with a couple of good recommendations for spots I’ll have to go visit in the future. I also heard encouraging words about the ease and affordability of taking the light rail from the airport. Being a fan of social media, it was great to know that our trainers encouraged us to take photos. Several of us took pictures of the posters created during our Day in the Life activity. One of our DiscProfile.com customers remarked, “I shared on Facebook how I was excited about going to this training and I had six friends respond about how they loved DiSC. So now I have a new network to talk about it with.” After this training my network has also expanded. You can join other DiSC trainers on LinkedIn in the DiSC Assessment User’s Group or the Facebook DiSC Practitioners and Fans group.